Jaguar Racing today announced that Brazilian Antonio Pizzonia (22) and Australian Mark Webber (26) have signed to compete for the team in the 2003 FIA Formula One World Championship. Mark and Antonio replace Eddie Irvine (36) and Pedro de la Rosa (31). These changes are with immediate effect. "I am thrilled to be welcoming Antonio and Mark to Jaguar Racing for what promises to be an exciting and new partnership in Formula One," said Jaguar Racing CEO and Team Principal Niki Lauda. "In Antonio, or ‘Jungle Boy’ as he has been nicknamed, we have a very gifted raw racer who will undoubtedly inject a new lease of life into Formula One. His speed and racing instinct are what attracted us to him and I have little doubt in his ability to shake-up the establishment in a big way. Mark, on the other hand, has solid F1 experience and now’s his chance to prove exactly what he’s capable of. We have two very different characters and I have every intention of revving them up in an effort to extract the maximum from them. Team orders is not something we play by at Jaguar and if anything, these two drivers will be under strict instructions to go out and fight each other on the race track – as well as everyone else, of course! We are red-blooded racers at Jaguar and from what I have seen of Antonio and Mark, I am confident of seeing a very competitive dual next season." After three seasons with the team, Eddie Irvine (36) makes way for the new driver line-up and his valuable contribution to the development and growth of Jaguar Racing is summed up by Niki: "I cannot thank Eddie enough for his hard-work and commitment during the last three seasons. He has been with us right from day one and while there have been some difficult and challenging periods to endure, Eddie’s resilience and focus remained throughout. His experience, speed and race craft are exemplary and the decision to replace him in no way reflects upon his clear ability as a competitive racer." 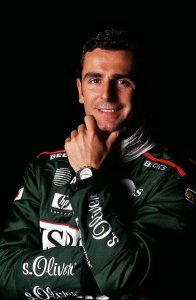 Pedro de la Rosa joined Jaguar Racing in April 2001 and made his debut for the team at his home race in Spain. "Pedro has unfortunately struggled with some aspects of the programme and in simple terms, it hasn’t really worked out for either party. It’s unfortunate, yes, but that’s Formula One. We wanted to adopt a fresh approach for next year and our strategy is firmly geared towards making progress at all levels of the business." 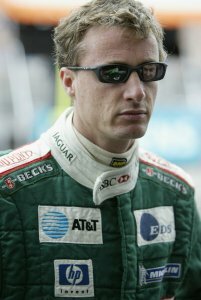 Mark and Antonio first tested the Jaguar R3 in Barcelona earlier this year during an evaluation exercise aimed at exploring the team’s options for the 2003 season. At the time, Mark Webber was contesting the season with the KL Minardi Asiatech Formula One team while Antonio has spent the 2002 season contesting the FIA F3000 Championship. In addition, Antonio has spent the season as BMW WilliamsF1 Team test driver alongside Ralf Schumacher, Juan Pablo Montoya and Marc Gene. Speaking from the States where he is preparing to contest this weekend’s New York Marathon, Antonio said: "After having spent a year testing solidly for BMW WilliamsF1, the logical next step was to secure a race drive for 2003 and to have been given that opportunity by Niki Lauda is simply fantastic. Jaguar Racing has made considerable progress in recent months and combined with the solid work being undertaken right now, I am very excited about racing for Jaguar next season. My testing role with BMW WilliamsF1 this season has generated over 14,000kms of mileage and my aim now is to focus this experience towards helping Jaguar achieve its goals next season." "I'm truly excited about racing for Jaguar next season," said Mark. "It is one of the most emotive and successful names in motor racing and one that has a wealth of motorsport heritage. As the latest recruit to join what is a distinguished line-up of Jaguar drivers from the past, I realise my role will be very important in helping the team succeed. It is a phenomenally competitive time in Formula One right now and given the intense development programme Jaguar has in place, it is critical that Antonio and I help accelerate the team’s progress over winter so as to be ready for what promises to be a very exciting season given the revised format of the race weekend. Having tested with the team at Barcelona earlier this year and from visiting the Jaguar Racing factory, I know there are a lot of good people involved with the team and we all know what we have to deliver next season." Antonio and Mark will begin testing duties with Jaguar Racing after the winter test ban is lifted from 26th November onwards.